Thanks to soaring oil prices, the International Air Transport Association had already cut its estimate of global airline net profits for 2011 by $8.6 billion, which would be down 46% from last year. And 2010 profits were hurt by volcanic activity in Iceland: The ash cloud from Eyjafjallajokull shut down air travel over large segments of Europe in April of last year. The news this week is eerily similar: Grimsvoetn, one of the most active volcanoes in Iceland erupted this weekend. 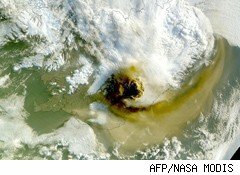 The eruption closed the country's airports, and its ash cloud is on its way toward the northern U.K. and Europe. Forecasters predict that ongoing activity from Grimsvoetn will effect European air traffic as soon as this Tuesday. The IATA's estimate for 2011 airline profits may have already been too high, even with its March downward revision. Crude prices are still near $100, which means that jet fuel prices could be high for the balance of the year. All the industry needs is a long period of volcanic activity in Iceland to force them to cancel flights across the Atlantic, as happened a year ago. Many of the airlines likely to face profit erosion due to the eruption are Europe's flag carriers. British Airways (BAIRY) flights would be particularly affected. But U.S. carriers with routes to and from Northern Europe could be hurt as well, among them American (AMR), Delta (DAL), and US Airways (LCC) . Shares in domestic airlines are already down about 15% over the last six months. So far, the volcano's largest impact has been to keep air traffic south of Iceland. But, as a story inThe Telegraph reads, "The ash could force the authorities to shut airports and close UK airspace, in a move which could disrupt many thousands of passengers almost exactly a year since a different Icelandic volcano closed airspace across Europe." For airline stock investors, it's worth watching. In Europe, shares have already started to sell off.